Making delicious quesadillas using your George Foreman Grill could not be easier. This recipe only uses a few ingredients and can be made in just minutes. You can use the recipe on this site for Easy Grilled Chicken Breast, or purchase pre-cooked chicken breast at most grocery stores and use as needed. Either way, you can’t go wrong with this easy and delicious recipe for Chicken quesadillas on your Foreman Grill! Preheat your Foreman Grill for 5 minutes with lid closed. Use the high settings if your grill has the temperature controls. Layout tortilla on a flat surface. Cover only half the tortilla with cheese and add chicken, green onions, coriander and tomatoes. Fold other half of the tortilla over the top of the cheese and chicken and then brush both top and bottom with olive oil. Grill for 4 – 6 minutes until cheese is nice and melted and tortilla is golden brown. 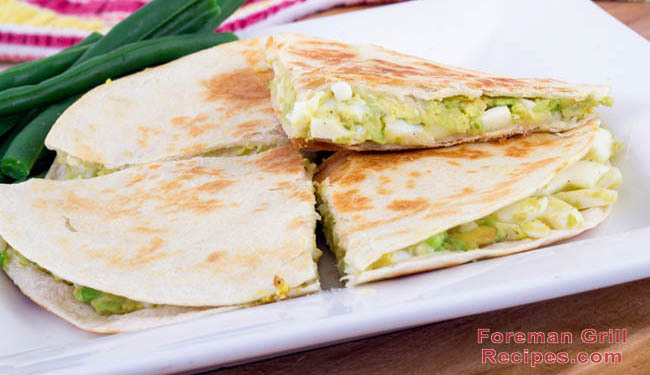 Remove from grill and use a knife or pizza cutter and slice the quesadilla into 4 pieces. Very good! My husband enjoyed his lunch. Good idea to grill on the George Foreman grill. Works wonders. I know I’m behind on the times here. Foreman has been around for a LONG time!!! But I just got one… Could of used this ages ago!!! Way to go george!!! Me too, haha. My girlfriend and I are always making quesadillas on ours.